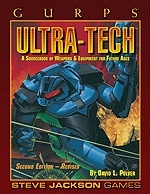 Daily Illuminator: Classic Tech, Now Downloadable Via Warehouse 23! August 18, 2014: Classic Tech, Now Downloadable Via Warehouse 23! If you're a fan of classic GURPS Third Edition supplements -- or just love to mine those volumes for new ideas -- then two must-haves are now available digitally on Warehouse 23. 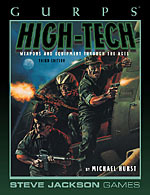 GURPS Classic: High-Tech is your guide to modern-day equipment and weapons, while GURPS Classic: Ultra-Tech goes through the possibilities and permutations of more far-flung fare. Both guides are essential for their genres, packed with gear and options for Third Edition players. (Really, they're useful for just about all campaigns; science-fiction games can make use of high-tech gear just fine, and what low-tech fantasy heroes wouldn't love finding a force-field generator or laser pistol?) Download both of these goodies today and peruse them the high-tech ultra-futuristic digital viewer of your choice!